Michael Corinthos Quartermaine and Nelle Hayes are trapped in a cabin in the woods together, due to a snowstorm. Nelle rejects Michael’s advances, and is desperate to get out of there, having planned to be leaving town to avoid the fall out of her nefarious scheming. Ned Quartermaine proposes to Olivia Falconeri, only to have her run away without explanation. He later finds her and proclaims to her that he will continue to prove himself until she feels confident in becoming his wife. Ned’s mother Tracy is spearheading a project with financial whiz Hayden Barnes, to put together a bid for the Quartermaine family to purchase General Hospital, which is teetering on bankruptcy and closure. The other Olivia, Olivia Jerome, back from the dead and on a revenge spree, has been forcing her brother Julian to do all that he can to secretly arrange the sale of the hospital to her. Olivia wants the hospital to be turned into high end condos, and is threatening Julian’s loved ones with bodily harm unless he gets it for her. Olivia Jerome had already insinuated herself into the life of Julian’s ex-wife, Alexis Davis, as her AA sponsor. In an attempt to best her, Julian tries to get her to drink poisoned champagne, which fails. In retaliation, Olivia Jerome sets a trap for Samantha Morgan, the pregnant daughter of Alexis and Julian, offering to give Sam a ride home. During the drive, through casual conversation, and recognizing clues in Olivia’s car that identified her as the mastermind behind the carb bomb used as an attempt on Julian’s life, Sam starts to put it all together. Olivia senses this, reveals her true identity as Sam’s long dead aunt, and holds Sam at gunpoint. During Sam’s attempt to escape, a struggle for control of the gun on a snowy foot bridge ensues, and the very pregnant Sam goes flying over the edge, crashing to the ground below. When she later regains consciousness, she is badly wounded, trapped in a cement canyon out of which she is unable to climb. Keeping her eye on the prize of General Hospital, Olivia’s henchman Rudge prevents Laura Spencer from attending the Hospital Board meeting in which her vote is key, by drugging Laura’s coffee and taking her passed out self for a joyride in her own car. Fearing his end is nigh, Julian has been taking himself on a doom and gloom tour of apology letters and legal arrangements in the event of his death. He visits his son Doctor Lucas Spencer, his ex-wife Alexis Davis, his baby-mamma Olivia Falconeri, and his half sister Ava Jerome. Ava, currently in prison for the bungled car-bomb attempt on Julian’s life that tragically killed young Morgan Corinthos, has no idea that her half sister Olivia is alive, let alone the person who framed Ava for her own crimes. She nearly get’\s Julian to confess, but he is too fearful of Olivia’s reach to explain. Jason Morgan, who has been investigating the car-bomb case with ex-cop Curtis Ashford, suspects that the long dead Olivia Jerome may be the culprit. 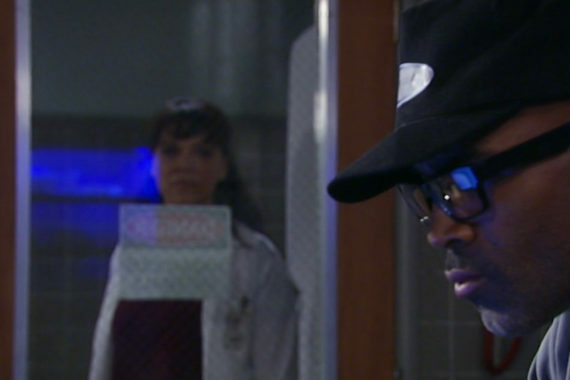 He runs into his old friend Doctor Robin Scoprio-Drake at General Hospital, and asks her what she remembered of Olivia. Robin explains that Duke Lavery, her mother’s true love, was the object of Olivia’s obsession. When asked if Julian’s murder of Duke would cause Olivia to want to retaliate, Robin responds that she is “surprised that Olivia didn’t raise from the dead and kill Julian herself.” This leads Jason to drag Curtis along to raid the Jerome family tomb to find Olivia’s coffin empty. Robin is only visiting Port Charles due to the hospitalization of her mother, Anna Devane. Anna had collapsed while breaking into the home of Valenitin Cassadine, who gallantly carried her into the hospital himself. Doctors Griffin Munro and Hamilton Finn break the news to Anna that her tests reveal that the cause of her recent migraines and eventual collapse were caused by a rare type of blood cancer called polycythemia vera (PV). Though there are treatments for PV, there is no cure. Anna deals with the emotional ramifications of this with Robin by her side. Unfazed by her current hospitalization, Nina Reeves, the wife of Valentin Cassadine, reports Anna’s break in to the police, only to later be chastised for this behavior by her husband. Nina is confused by the situation. Anna is also confused by the situation, still not clear as to what exactly happened between the when she and Valentin were both cadets at the World Security Bureau. Valentin refuses to tell Anna what happened, and doesn’t seem to be forthright about the situation with Nina, either. Tracy Quartermaine offers Doctor Hamilton Finn use of the family jet so he can travel to New York City for a business meeting regarding the licensing of the drug Finn had discovered to cure Blackwood Syndrome. However, not able to fight the addiction to opiates he’d developed after being on the drug zikonestrol for many years, he instead takes the jet to destinations unknown to score his drug of choice. When Finn does not arrive at the meeting as schedule, Doctor Munro confesses to Finn’s romantic partner, Hayden Barnes, that he suspects Hamilton has been abusing opiates. Hayden confronts Hamilton, and in the face of his refusal to go to a rehab facility, she walks out on him.